Thomas “Tommy Joe” Thompson, 72, of Wauseon, OH, died at 2:40 p.m. (EST) on Sunday February 3, 2019 at the comfort of his home. He was born on September 12, 1946 in Robinson, IL, the son of Harold Thompson & Iola (Cornwell) Thompson, both of whom preceded him in death. He married Linda Cook on February 14, 1970 and she survives. He is also survived by his sister, Starlite Thompson; by his niece, Dr. Jordana Baker; as well as several nieces, nephews and cousins. Tom grew up in the Hammond Indiana area and was a 1966 graduate of Hammond Tech. He proudly served his country in the U.S. Army during the Vietnam War and would go on to serve in the Army Reserves as well. He worked for a number of different companies all over the country, including Westinghouse Nuclear and Sun Oil Refinery, from whom he retired in 2012. Away from work, Tom could often be found tinkering on his vehicles. A motor enthusiast by all accounts, he attended countless car shows through the years. He and Linda also enjoyed camping and were especially fond of making excursions out west. This was a great source of peace and joy in his life. Tom Thompson was a man who enjoyed the simple things. We are thankful that the gift of his memory will live on in our hearts forever. He was a lifetime member of the V.F.W. as well as the Moose Lodge. A time of visitation will be held from 4:00-7:00 p.m. on Friday, February 8th at the Prust-Hosch Funeral Home in West Union, IL. Another time of visitation will be held from 10:00 a.m. until service time at 11:00 a.m. on Saturday, February 9th at the funeral home, with Celebrant Curt Goodwine officiating. During the service, there will be an opportunity for family and friends to share their favorite memories of Tom. Burial will be in the Medsker Cemetery and military rites will be conducted by the West Union American Legion Post #1130. Memorials may be made to the BrightFocus Foundation, a nonprofit organization that supports research and provides public education on brain and eye diseases, including Alzheimer's disease, macular degeneration and glaucoma. Envelopes will be available at the funeral home. His family would like to thank Heartland Hospice Care for all the care and concern they showed and gave to him in his final days. To send flowers or a remembrance gift to the family of Thomas "Tommy Joe" Thompson, please visit our Tribute Store. 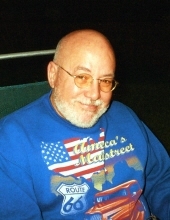 "Email Address" would like to share the life celebration of Thomas "Tommy Joe" Thompson. Click on the "link" to go to share a favorite memory or leave a condolence message for the family.